SafetyTac® Floor Tape is our best-selling floor marking tape and for good reason. SafetyTac® floor marking tape is designed to withstand the tough conditions of an industrial workplace. 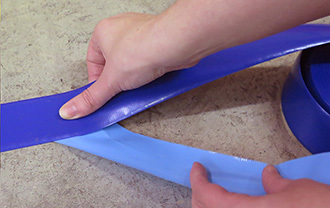 SafetyTac®'s resilient material holds up to traffic and spills, and its reinforced rubber-based adhesive keeps it in place, so it will get the job done for a long time. 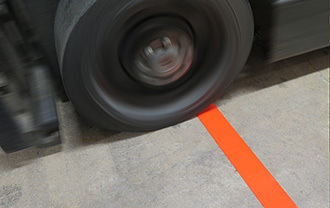 SafetyTac®'s dual-stage tapered edges prevent the tape from getting caught on wheels or pallets. That means vehicles can easily slide over the tape without causing damage. SafetyTac® also has a low profile, so it won’t make walking surfaces uneven. No need to worry about pedestrians tripping. SafetyTac® can withstand the tough conditions of an industrial workplace. It will hold up to traffic, wet conditions, and even chemical spills. Hands down the best I've used..
At first glance we didn't think this could hold up so we put it in our highest traffic area and couldn't believe the results. Now we have installed this product throughout our facility and its still holding up great! Loved the free skittles too! We purchased 10 rolls off a mailer we got and it works great and I have told a number of others about this tape. Great floor marking products. We use the hazard and the standard yellow for a lot of our warehouses. Thanks again. Very simple and easy peel-&-stick installation. Love it! 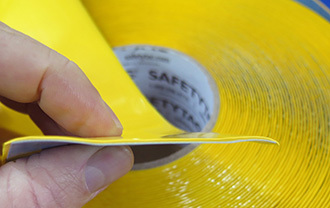 SafetyTac tape is simple to install and lasts a long time for most of the areas in our industrial plant. Very happy with this floor tape. This tape works well as a line marker for our warehouse. We replaced painting the lines because it got to be a pain in the neck. I never wrote a review for tape before, but couldn't resist. We were having a lot of trouble with our painted lines in our mill. The humidity was making the paint bubble and it wouldn't stick for some reason. Our safety manager gave me a sample of some floor tape he got at a tradeshow, and said the guy who demonstrated it showed how easy it is to install and that it will stick to almost anything, so we decided to go with one roll to try it out. It went down quick, and the millwrights even changed out a roller bearing on it and it didn't ruin the tape. Pretty happy with this tape. We purchase a ton of 3" yellow and 2" wide blue for our warehouse floors. We have forklifts and pallet jacks running over them every day, and this tape is pretty durable. When we have a spot that is getting brutalized, we just cut it out and replace the section with some new tape.